United Nations Deputy Secretary-General, Jan Eliasson, joined the event and stressed the importance of giving voice to one of the most “invisible, vulnerable” groups in modern societies: children deprived of liberty. “Like all children, these detainees need care and protection; they need opportunities, education and guidance yet conditions in places of detention are often poor and dangerous. Many facilities are overcrowded, unsanitary and lack adequate oversight and regulation.” stressed Mr. Eliasson. The event aimed at discussing the scope and key issues that will be addressed by the Global Study and to present the institutional framework created in the support of its preparation, including the establishment of a UN Inter-Agency Task Force, the Group of Friends, the civil society forum, including the NGO Panel on the Global Study on Children Deprived of Liberty and the network of academics/research institutions. n her remarks, Ms Santos Pais urged all participants from governments, the UN, academia and civil society to join in this endeavour and recalled the current situation faced by children behind bars. "Held in closed institutions, psychiatric centres or adult prisons, where they await trial for long periods of time and may live in inhuman conditions, these children often lack genuine opportunities to access justice and challenge the legality of their detention, or to benefit from education and vocational training, necessary health services and long-lasting social reintegration. Once deprived of liberty, children are at heightened risk of human rights violations, including harassment, sexual abuse and acts of torture." stressed SRSG Santos Pais adding that "addressing this appalling situation is not only critical for achieving sustainable development; it is also a legal and human rights imperative." Ms Santos Pais has spearheaded efforts to establish an institutional framework and prepare the ground for the Study, including through the mobilization of political support and funding for its development . "As implementation of the 2030 Agenda starts, countless children are already being left behind. This includes children deprived of their liberty, including children who have run away from domestic violence, those who are victims of trafficking, prostitution, organized crime or conflict situations, or as a result of mental health and drug abuse, or because of their status as migrants or asylum seekers. " The event demonstrated that a study is seriously needed to help to consolidate data and sound evidence to ensure that children deprived of liberty are counted for and visible in the development of policy and law. The panel also included SRSG on Children and Armed Conflict, Ms. Leila Zerrougui who stressed the vital importance of a study to map the situation of children involved with criminal justice systems in countries affected by conflict, Ms. Peggy Hicks, Director of the Research and Right to Development Division, OHCHR, Mr. Juan Mendez, UN Special Rapporteur on Torture and other Cruel, Inhuman or Degrading Treatment or Punishment, Ms. Anna Giudice Saget, Crime Prevention and Criminal Justice Officer, Justice Section, and Ms. Jo Becker, Advocacy Director, Human Rights Watch and it was moderated by Ms Anniken Enersen, Senior Advisor, Ministry of Foreign Affairs, Norway. The study is anticipated to include good practices and recommendations for action, and is expected to be submitted in 2017 to the UN General Assembly. 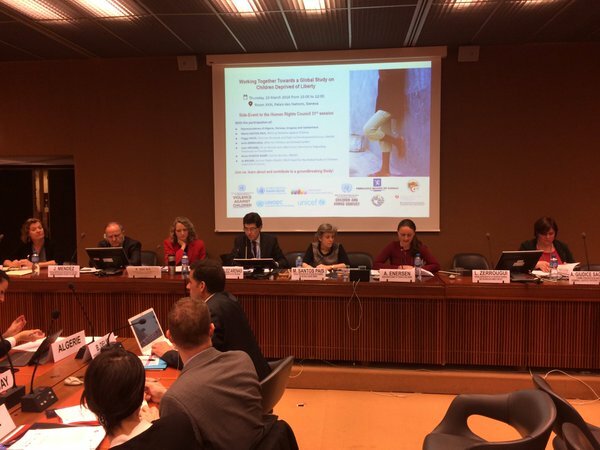 On March 9, SRSG Santos Pais participated in a side event organized in the context of the latest thematic report by Special Rapporteur Juan E. Mendez (SRT) on gender perspectives on torture and other cruel, inhuman or degrading treatment or punishment (A/HRC/31/57). The side-event aimed at sensitizing member States to their heightened obligations to prevent and combat gender-based violence and discrimination against women, girls and LGBTI persons that amount to torture or other ill-treatment. In her remarks, SRSG Santos Pais called for more effective response mechanisms in justice systems worldwide, particularly in children’s access to justice and their exposure to violence in detention facilities. “In many countries it is particularly hard for girls to approach police stations or courts, for fear of verbal intimidation and harassment, and of seeing their testimony dismissed. Once they enter the criminal justice system, girls are at risk of stigmatization and violence that may be worse than what they experienced in their homes and communities. For justice systems to be responsive to the specific situation of girls and sensitive to the challenges they face, the underlying causes for girl’s involvement with the criminal justice system need to be assessed and addressed.” added SRSG Santos Pais. The findings of the recently launched OSRSG-VAC Report Safeguarding the Rights of Girls in the Criminal Justice system demonstrate that incidents of violence against girls are often associated with a culture of silence, shame and fear that inhibits them from speaking out and seeking help.